* Advanced colour accuracy solution for all of your laptop and desktop monitors. * Fast and easy, full calibration takes only about five minutes to ensure colour accuracy and less than half the time for monthly re-calibrations. * Room light monitoring determines optimal monitor brightness so you see fine shadow detail and highlights in your photos, ensuring your edited images match your prints. * “Before and After” evaluation of your calibration results using your own photographs, to focus on details that are important to you. * Display Analysis feature lets you evaluate and compare the performance of all of your laptop and desktop monitors. * Next Generation Spyder5 is compact and portable with a built-in lens cap. * Guaranteed color accuracy with the industry’s only patented 7-detector optical engine resulting in more accurate shadow detail and smoother gradients. * See, share and print your images just as you intended with confidence. Displays render the same image differently: Calibration tunes your display to a reference standard and brings colour consistency across desktop, laptop, multiple displays, iPad and iPhone. Wide gamut displays may be oversaturated: Without calibration even wide-gamut displays may be inaccurate. Highlight and shadow details may be inaccurate: Control of brightness, white point and tone response with calibration. Photographers and designers can work confidently on a properly colour calibrated screen and can assert greater control over the colour fidelity of their digital process. Images can be reliably assessed and adjusted on a properly calibrated display, enabling true-to-life reproduction of image files. Advanced. Precision. Colour Accuracy. With Spyder5PRO, you will take your skill to the next level with precise and accurate monitor colour. True colours – on screen and in print. Break free from the frustration of your prints not matching your on-screen image. Spyder5PRO determines optimal monitor brightness so you can see the fine shadow details and highlights in your photos, ensuring your edited images match your prints. Room Light Monitoring. Spyder5PRO’s integrated room light sensor continually measures your room’s lighting conditions and alerts you if there has been a change among three ambient light levels. Then you can choose to either modify your calibration settings or adjust your room lighting to assure optimal colour accuracy. Fast & Easy. 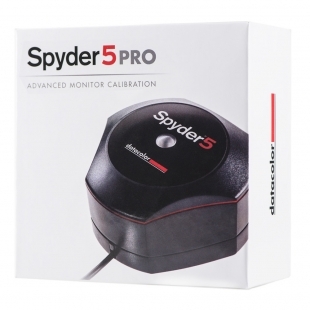 Spyder5PRO software is extremely easy to use, with a simple step-by-step wizard that guides you through the initial 5 minute calibration process, for all of your desktop and laptop monitors. Then perform a fast monthly recalibration in half the time to keep colours consistent. Tomorrows Technology. Next generation Spyder technology comes with a colorimeter that is compact, portable and protected. We’ve redesigned Spyder’s patented 7-detector optical engine to deliver up to a 55% improvement in tonal response, resulting in more accurate shadow detail and smoother gradients. Personalized “Before and After” with SpyderProof ™. See the nuances that matter most with a “Before and After” evaluation of your calibration results using your own image, or a professional Datacolor composite image. SpyderProof gives you confidence that your monitors achieve precise colour accuracy. Display Analysis. Its important to know the characteristics of your display when doing colour-reliable work. Get to know how your monitors perform with the Display Analysis feature, which allows you to compare the colour, brightness, contrast, gamut, tone response and white point across all of your laptop and desktop monitors. System Requirements • Windows 7 32/64, Windows 8.0, 8.1 32/64 • Mac OS X 10.7, 10.8, 10.9, 10.10• Monitor resolution 1280×768 or greater, 16-bit video card (24 bit recommended), 1GB of available RAM, 500 MB of available hard disk• Internet connection for software download • USB port. Please place your order via email or call us direct.